The "Whale Wars" are about to intensify. Again. The Japanese whalers are enlisting two military-style security vessels to ensure they'll not be thwarted in their annual effort to kill hundreds of whales under the guise of research. The Sea Shepherd Conservation Society, an anti-whaling group that for seven years has been tormenting and harassing the whalers in an attempt to prevent the senseless killing of whales, are now using drones to locate the whalers' mothership. You've probably heard of "Whale Wars." Over the last seven years around this time, the Sea Shepherd has sent a fleet to the Southern Ocean in the Antarctic for the sole purpose of saving whales. For the last four years, its exploits have been videotaped and turned into a reality TV series called "Whale Wars," which debuted on Animal Planet on Nov. 7, 2008. Last season, Sea Shepherd enlisted a sophisticated, high-speed boat called Godzilla to locate the factory ship, called the Nisshin Maru. 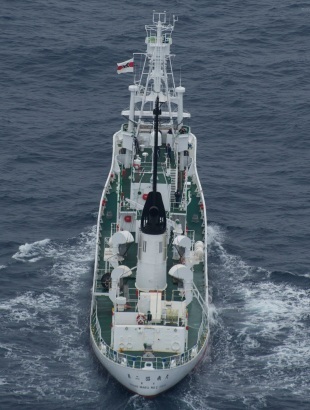 But when Godzilla broke down, Sea Shepherd had a difficult time relocating the Nisshin Maru, which processes whales killed by crews aboard harpoon boats. 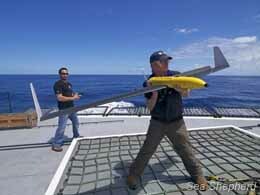 So now, Sea Shepherd has drones. Readying to launch a drone. The drone named Nicole Montecalvo was donated to the Steve Irwin by Bayshore Recycling of New Jersey. The plot is definitely thickening since Captain Watson seemed to indicate that the Japanese whalers and their security vessels are coming armed this time. Two Japanese security vessels with uniformed guards were tailing anti-whaling group Sea Shepherd's flagship, Steve Irwin, [Monday] night as it headed towards the Southern Ocean whale sanctuary. The anti-whaling group plans to block the factory ship's slipway to prevent any dead whales being dragged aboard and flensed. Steve Irwin captain Paul Watson said [Monday] he was surprised by the military-style bunkers on the decks of the vessels and extent of the whaling fleet's security. "There seem to be a lot of changes on the Shonan Maru 2 this year, with armed security personnel and they seem to have a bunker-type thing on the top of their ship with sandbags," Capt. Watson said. "I don't know if they are expecting us to attack them with weapons or something. They seem awfully paranoid. "We are just there to stop them killing whales but we are doing everything we can to make sure we don't hurt these people." Capt. Watson said rancid butter bombs were the worst thing the conservationists would be using against the whalers this year. Late [Monday], the Steve Irwin was about 50 nautical miles behind the factory ship while the two security vessels were sitting about seven nautical miles off the Steve Irwin's stern. Sea Shepherd's other two ships, the high-speed Brigitte Bardot and the Bob Barker, were not being tailed by the Japanese. Stay tuned for the next season of "Whale Wars." Could get nasty.